If you haven't read yesterday's post yet, then read that one first and then come back to this one. Also, consider taking an hour and listening to the Studio 360 interview with Harlan Ellison (link in yesterday's post). Today, while toiling at the day job, I was thinking about Ellison and the sheer number of really cool books he has published. I have copies of a fair number of them and I'd like to have more. I'm still kicking myself for not having bought those White Wolf re-issues of a lot of his stuff from a few years ago. When those started coming out, I was still fairly well-to-do job/money-wise and could have afforded them rather than wasting so much of my disposable income on less worthy books as well as CDs, DVDs and other obsolete ephemera. Among the personal favorites is Shatterday, which I mention in a comment on the previous post as having had an especially great impact on me as a kid. I used my high school-age membership in the Science Fiction Book Club to load up on great Ellison collections like Alone Against Tomorrow and Deathbird Stories. I scored from a library book sale years ago a copy of the spectacular The Essential Ellison edited by Terry Dowling. This is one of those massive, thick tomes that you can't really read in bed: it's so heavy that you need to sit at a desk with it, but it is a terrific retrospective (well, up till about 20 years ago when it was published) that even includes a couple pieces of Ellison's juvenilia as well as his earliest professional stories and many, many of his classics. I also have a copy of The City on the Edge of Forever book which contains his original teleplay for the Star Trek episode (you know, that one). That book is worth the cover price just for the Ellison's lengthy but fascinating introduction where he tells his version of his association with that show. 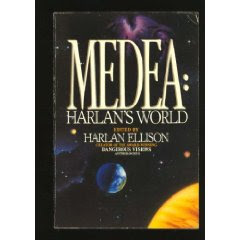 One that I am missing, however, that I wish I would have bought when I had the chance, is the one pictured here: Medea. I remember seeing it when it was new on the shelves of Waldenbooks, a big thick trade paperback that I was sorely tempted to buy but never did. I was fourteen years old and was spending nearly all my allowance/odd jobs money on Star Trek novels (that was the heyday of the Trek novel actually! ), and the dollars that it would have taken to buy Medea was enough to score me four or five mass market paperbacks. I did get a chance to read it thanks to a public library some years later, but I still wish I would see a copy of it at the used shop so I could add it to my Ellison shelf. The book developed out of a seminar that Ellison and some other writers conducted in 1975. It was a remarkable experiment in collaborative world-building. It contained a lot of the "science" of this invented world with articles by Hal Clement, Poul Anderson and others, and also a bunch of short stories set in the shared world. Authors included Larry Niven, Fred Pohl, Tom Disch, Ted Sturgeon, Frank Herbert, Kate Wilhlem, Robert Silverberg, Jack Williamson, Hal Clement and Ellison himself with his story "With Virgil Oddum at the East Pole."